Hubby and I were dropping our daughter off at a friend’s house in Fishers at dinner time and just did a little search to see what was nearby. We ended up settling at LouVino as a kind of last minute choice. It’s a small chain out of Louisville, with a couple of locations outside Kentucky, and according to their website, one coming to Mass Ave soon. Anyway, it’s meant to be a wine bar—a fairly big selection and most you can get buy the glass. Unfortunately the very first one hubby ordered they were out of. We settled on a couple of choices and looked over the menu. They mainly have shareable small plates, but some of the bigger ones that you can make an entrée out of it you want to. 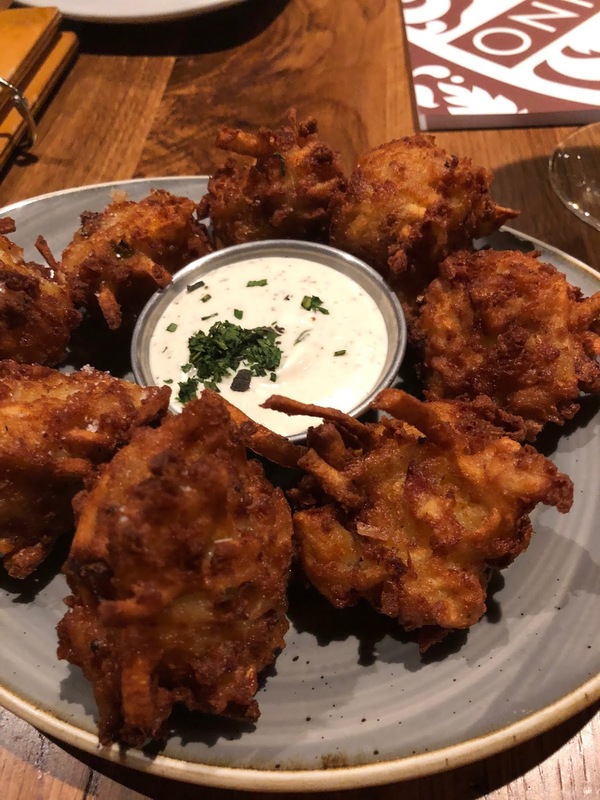 We were torn between the duck fat frites and the stuffed tots. We ended up with the “loaded baked potato tots” ($9). 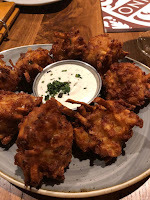 I wasn’t sure exactly what to expect, but it was basically like mashed potatoes, cheese, bacon and scallions mixed together in balls and then deep fried. They were served with a side of their homemade ranch. They were pretty good, but a little bland I guess. Neither of us felt like we needed more than 2 and we were done. They just needed a little something more—you couldn’t really taste the cheese and other ingredients that much, mostly just the potato. Not a bad thing, but not as exciting as I hoped. I did like the ranch dressing. It tasted fresh and house made. It had a thinner consistency than those store-bought ones that seem sort of like they are made with chemicals. 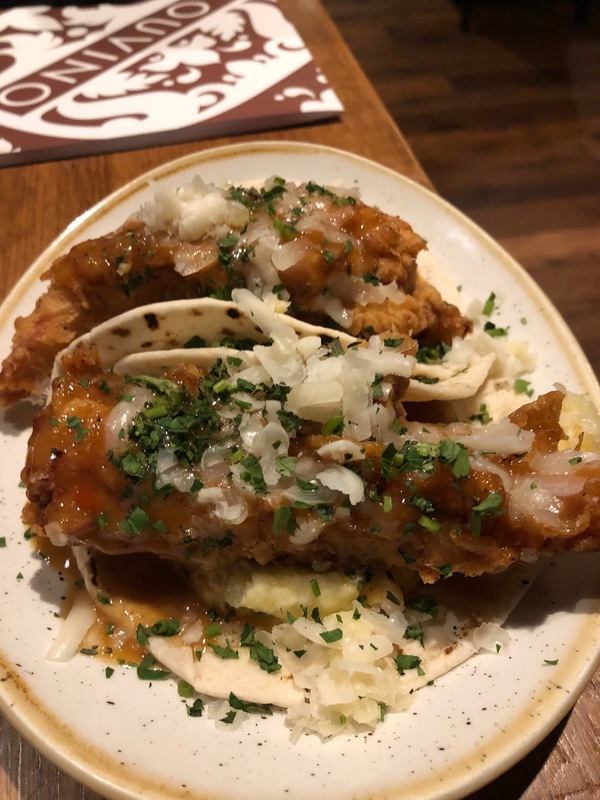 Next, we had the fried chicken tacos ($10). Again, not exactly sure what to expect, but it was basically exactly that. Tortillas that were grilled, filled with mashed potatoes and cheese, topped with a piece of boneless fried chicken breast and gravy. An interesting concept, and I guess the tortilla made it a hand-held, but I didn’t really see the need for the tortilla. The piece of chicken was seasoned really nicely though and cooked just right so it was tender and juicy. It was a tasty bite of food, but then again, you know I am a sucker for fried chicken. I probably would have rather dipped it in the gravy to keep it crispier, but I am sort of a crispy crust fanatic. 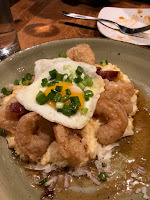 Our last savory course was the best one, the shrimp and grits ($13). I’ll be honest, I was pretty much expecting the shrimp to be chewy and tough because so few places get it right. To the point that I rarely order shrimp at a restaurant. But this was very good. The shrimp were actually lightly breaded and fried so they had an appealing crunch and were cooked just right. They were very good. The cheesy grits they were sitting on, were also very good. And of course, you know I am a sucker for a perfectly cooked egg. There were also some crispy bits of ham. All of that stuff made for a great dish. The part I didn’t like about it was the “spicy maple” sauce that was luckily mainly on one side of the bowl. I didn’t care for the sweetness that it added, and we kind of dammed it up on the plate so it stayed out of most of our bites. Next time I would hold this sauce. If I were summing up the food overall, I would say it was pretty good and pretty rich and hearty. I was sort of craving something acidic and bright to go along with each dish. I would have loved some green tomatoes or something like that with the shrimp or the chicken. 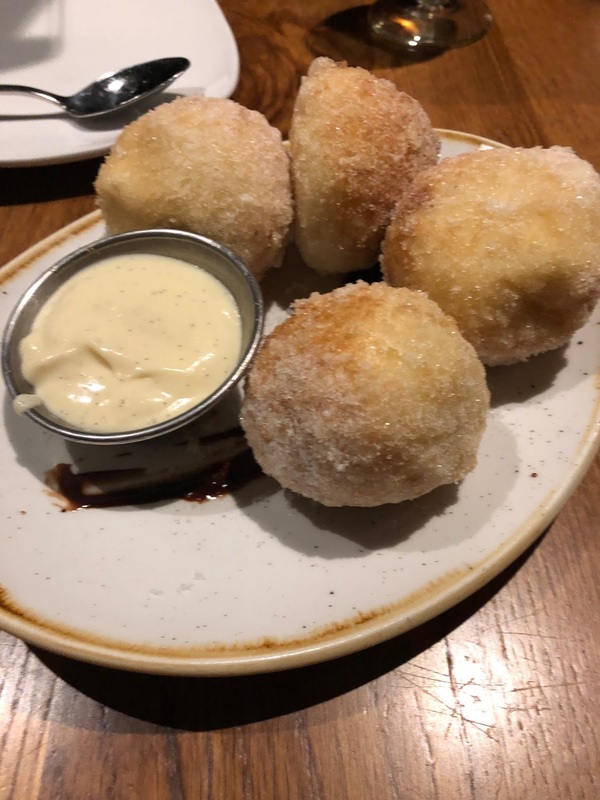 We decided to get dessert and it followed the rich pattern, but when you are eating chocolate chip cookie dough beignets, you kind of don’t care. They were pretty darn tasty. Hubby was a big fan especially. They are fried doughnut balls, and they are filled with lots of chocolate chips and batter that is super hot. They serve it with a vanilla anglaise dipping sauce for just a little extra decadence. They were tasty though. Sorry I didn’t take a pic after I had cut in to them! Much more interesting. Overall, I would say if I lived in Fishers, I might go to this place on occasion. I don’t think it is really a place I would go out of my way for though. Even though nothing was bad, it wasn’t super exciting. The interior is sort of upscale chain feel—lots of wine décor. It was comfortable enough, although a couple came in and got seated right next to us and one of them reeked of cigarettes and some kind of cover up attempt--perfume or something. It sort of put a damper on my taste buds. But what are you going to do? I do wish they didn’t seat everyone so close together when there were many empty tables though.